LADIES RIGHT-HAND 10.5-DEGREE TOP-FLITE TITANIUM DRIVER (Ladies’ Flex) - BRAND NEW WITH HEAD COVER! Maximize tee box potential with this Top-Flite XL Titanium Ladies DRIVER. The large, 460cc head features geometric construction to reduce aerodynamic drag for incredible club head speeds and performance. A 10.5° loft configuration and low Center of Gravity placement pair to generate quicker, higher launch and longer flight for unrivaled playability. This fine titanium driver features a lightweight graphite shaft (Ladies’ flex) and rubber grip. •	Large 460cc club head is the largest allowed by the USGA for enhanced forgiveness and playability. •	Geometric construction reduces aerodynamic drag for increased club head speeds and distance. •	10.5° loft generates exceptional penetrating launch characteristics for superior distance and ball flight. •	Low Center of Gravity placement encourages faster launch for unrivaled playability. •	Ladies flex Graphite Shaft further optimizes club head speed and overall distance. •	42 1/2" length ideal for increased directional control. 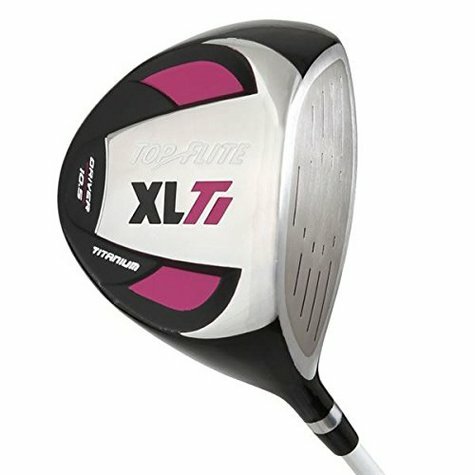 Although this Top-Flite XL Titanium Ladies DRIVER has been crafted as a ladies’ driver, its light weight, 460cc head, and boring trajectory make it a superb choice for senior men golfers! This club is brand new and has never been hit. Original Top-Flite headcover included! PRICE: $55 with FREE SHIPPING! This Top-Flite XL Titanium Ladies DRIVER is located in Greenwood, IN and may be examined or picked up at this location. Contact seller for additional information or to arrange inspection and purchase. PAYMENT OPTIONS: Cash only for local pickup; certified check, USPS Money Order, or personal check when shipped. Please allow at least 7 days for check to clear local bank. LOCAL PICKUP: By prior arrangement. See details above. SHIPPING: Shipping is FREE to any verified address within the contiguous continental United States.